If the intensity of state propaganda over the last few years is anything to go by, Erdogan and AKP have moved well beyond considerations of “soft power". He has wielded the myth of the “parallel lobby” — a label for opponents real and invented — in countless public speeches ever since. Pro-government media have been essential in helping to get the message out. From the CIA, to the international Jewish conspiracy, to an interest rate lobby, to Lufthansa Airlines, to a mysterious telekinetic attack by dark forces; the list of so-called “lobbies” has become extensive. But only one man was sufficiently controversial to offer up the real, living and breathing enemy to take state propaganda to the next level. Fethullah Gulen, a Pennsylvania-based Turkish preacher and visionary, was Erdogan’s ally before he became his enemy. After AKP’s first landslide victory in 2002, the pair worked together to re-shape Turkish politics, long-dominated by a secular military elite. 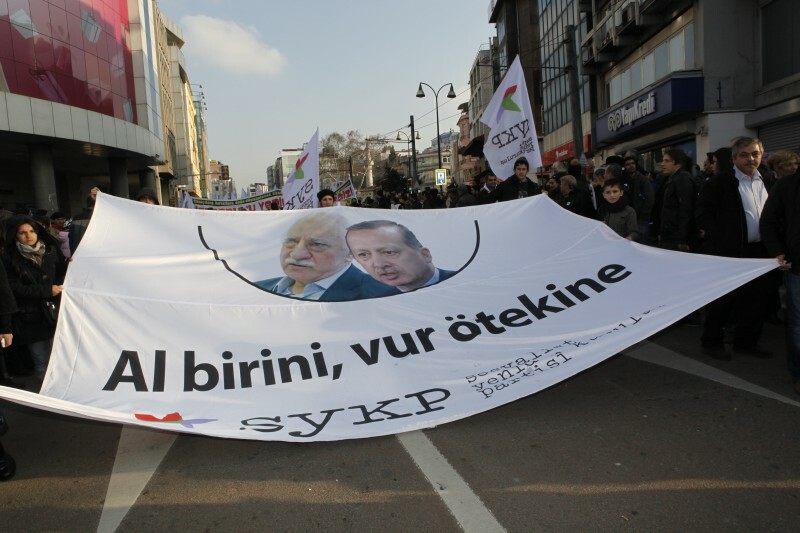 But as Erdogan looked to extend his power, Gulen’s undoubted influence inside the government became a hindrance. By the time the Gezi protests took place, it had reportedly collapsed. Since a coup attempt the government blames on Gulen took place last year, vicious attacks on the preacher’s network in the government-controlled media have reached a crescendo. While there remain credible suspicions regarding Gulen’s involvement in the 2016 failed coup attempt, other charges leveled at him have been faintly ridiculous. Among these are the suggestion, prompted by Erdogan himself, that Gulen’s movement may have been responsible for shooting down a Russian plane that allegedly entered Turkish airspace during a mission in Syria in late 2015. Ankara was looking to repair damaged relations with Moscow at the time Erdogan made the claim. Clearly, Fetullah Gulen and his movement serve the same broad and convenient purpose that Trotskyites and Tsarists did for Stalin. They help the autocrat lend credibility to actions that would otherwise make no sense, and in doing so, defeat his real enemies: truth and democracy. CNN’s Christiane Amanpour was indignant after Turkish pro-government daily Takvim published a fake interview with her in which she ‘confessed’ to being forced to cover the Gezi protests in a way that cast a negative light on Turkey. Screenshot taken from Hurriyet Daily News report on the subject. Indeed, peddling “implausible claims” has become a norm in Turkey. In the crackdown that followed last year’s failed military coup, more than 100,000 employees lost their jobs. The government sees Gulenist enemies of the state wherever it wants to, especially in what remains of the free press. Erdogan’s crackdown has extended itself to international visitors and foreign governments as well. Moreover, Turkey’s foreign ministry has let the world know that it believes the Gulenist scourge is active beyond the country’s borders, too. Outside Turkey, Gulen is best known as an educator, with schools using his approach to education located in around a hundred countries across the world. Even before the 2016 coup, Turkey had begun putting heavy pressure on many countries — notably in Africa and Central Asia — to close the schools. That pressure has been ramped up in the failed putsch’s aftermath. Ironically, prior to Erdogan’s fallout with Gulen, the schools were seen as institutions of excellence that created Turkophiles in much of the developing world and contributed to the country’s growing “soft power”. Writing for Al-Monitor back in 2015, Fehim Tastekin noted the counter-productive nature of the drive to close the schools. Unfortunately, if the intensity of state propaganda over the last few years is anything to go by, Erdogan and AKP have moved well beyond considerations of “soft power”.